You are on your way to work, rushing to get the kids to school, or just running errands and it happens. The car stops running. The tire makes a dreaded sound - Thump! Thump! Thump! The battery dies. You return to your vehicle only to realize that your keys are locked in the car. These situations can be incredibly stressful. After all, no one plans to be stuck on the side of the road when they wake up in the morning. If you find yourself in need of tow truck services, give us a call. Roadside Services Towing of NWA is the professional and dependable choice for towing services in the greater Northwest, Arkansas area. We service Fayetteville, Springdale, Rogers, Bentonville and the surrounding area. Basically, if you are located in Benton or Washington County we can probably help you. We have a fleet of 12 trucks manned by professional drivers who are ready to respond to your call for help. We are open 24-hours per day, 7 days per week. Give us a call! Our fleet of trucks is primarily composed of flatbed tow trucks and not the hook and chain that is so common. Many of our customers prefer having a flatbed truck tow their vehicle because the chance for damage is greatly reduced. For example, hook and chain tow trucks are notorious for applying pressure on the vehicle being towed or the wrapped chain can scratch or dent the car’s body. Additionally, a hook and chain tow truck cannot tow a vehicle that is all-wheel drive or 4x4 because it may damage the powertrain. Flatbed trucks are the preferred way for towing motorcycles or all-terrain vehicles too. 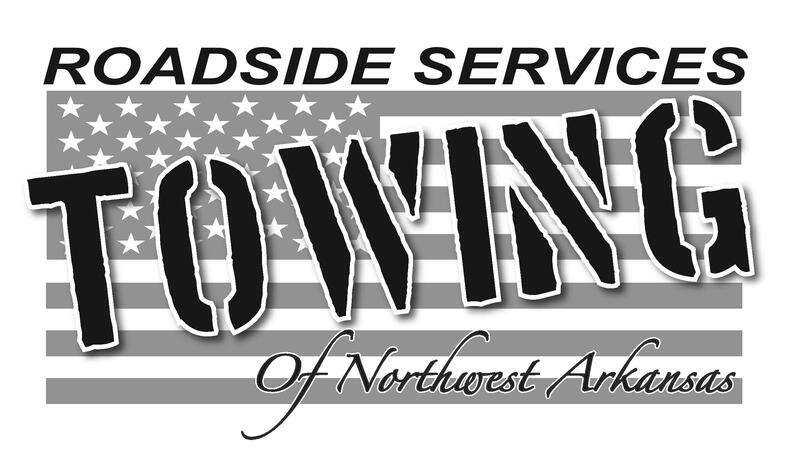 Roadside Services Towing of NWA has been approved as a AAA tow service provider in NWA. Although you may not be a AAA customer, it is good to know that the tow service responding to your request is trusted by the nation’s leading automobile association. This distinction is not obtained easily, but requires AAA contractors to undergo a rigorous application process to ensure that AAA customers receive the best service from a reputable tow company. Each contractor is required to show proof of obtaining a state regulatory license to operate. Proof of liability insurance that meets federal regulations and laws. Truck permits that verifies a tow company has the authority to tow a vehicle without the owner’s consent when necessary. Driver are required to have certain licenses. These licenses do not only ensure that the driver can competently operate a tow truck while on the road, but that he or she knows the local laws that govern tow truck activity. In addition to having the proper license, each person who works for Advanced Services Towing and Recovery is required to undergo an extensive background check.